Waking up begins with saying am and now. This is the first line of Christopher Isherwood's A Single Man and also the first line of Tom Ford's film based on the novella. It's a wrenching first-scene as Colin Firth's character George Falconer, learns of the sudden death of his long-time lover [played beautifully by Matthew Goode]. 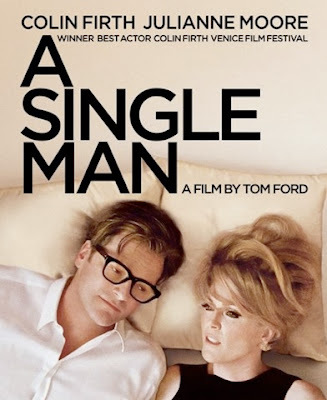 A Single Man is the most poetically captivating film I've seen since Julian Schnabel's The Diving Bell and the Butterfly. And, Tom Ford's directorial debut is brilliant. Each scene, whether filmed as a flashback or not, translates like a memory—the light, the tempo, and depth of the moment. Each shot is precise, with intimate close-ups and ethereal pauses that are artful but never cliche. Colin Firth is hypnotic in his Oscar-worthy portrayal of protagonist George and Julianne Moore is amazing—with her tousled hair and cocktails—as a sixties divorcee and George's best friend, Charley. The George and Charley scenes magnify the core of each character's despair and loneliness and hold a visual aesthetic that I could watch again and again. Amidst the sadness, A Single Man delivers life-affirming moments—the "buttered toast" smell of a dog's head, and the sudden act of an owl taking flight as a metaphor for the clarity that awakens within George. It's a film about living in the moment and appreciating the small things in life—and it's excellent each step of the way. Thanks for sharing, Barbara. I really cannot wait to see this! You will love it and the sets are perfection!